Home Conferences & Tradeshows Thanks to Vin of Vin’s Domains! Thanks to Vin of Vin’s Domains! One of the nicest things about having a blog in the domain investment space is that I get to meet many people who are also domain investors. Earlier this Summer, I helped organize a meet up at a Red Sox game at Fenway Park, and that gave me the opportunity to meet Vincent Jacques of VinsDomains.com. Vin has commented on my blog and we’ve exchanged emails in the past, but we had never spoken prior to the meet up. At the Red Sox game, Vin and I talked about domain investing and also about the New England Patriots. Vin’s had tickets for a while, and he promised that at some point we would go to my first Pats game at Gillette Stadium. True to his word, a couple of months later, Vin emailed me offering tickets to the home opener against the Jets. Vin, his friend Mike (also a domain investor), my brother, and I met up for a great tailgate a couple of hours before the game, and we had a great time watching the Patriots beat the Jets (despite the second half torrential downpour). We spoke about Boston sports, family, and we also chatted about domain investing. It’s nice to be able to do that, especially because I don’t know many local people who are domain investors. If there are domain investor meetups, conferences, or events in your area, I recommend attending if you want to meet others who also invest in domain names. It’s a great way you can meet people who do what you do, especially because this can be an isolating business. 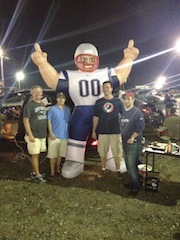 Thank you to Vin for a great tailgate and for taking me to my first Patriots home game. Looking forward to meeting up again in Florida for the TRAFFIC conference. It was my pleasure Elliot…glad you could join us! 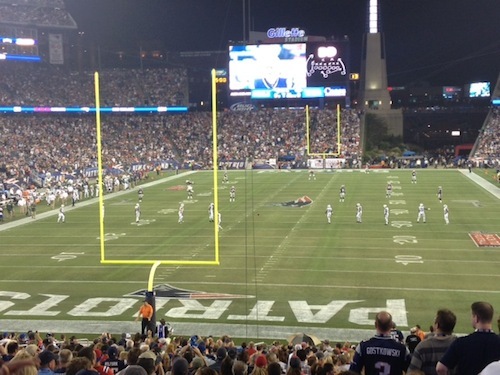 LUCKILY, the Pats squeaked that one out for us! The place where I live and work, It’s not the case. Not most of the people are aware of online opportunities.